Sports Costs > How Much Does a Basketball Hoop Cost? How Much Does a Basketball Hoop Cost? Having a basketball system in your driveway can be a great advantage for your child to become a better player. It can also be a fun asset to your house for people of all ages who enjoy the sport. A basic portable height-adjustable basketball system will cost between $70 and $300. This price will vary depending on the size and material (usually plastic, plexiglass, acrylic or glass) of the backboard. The material and size of the backboard will also determine the size and weight requirements of the base. This is very important for stability purposes. Lifetime makes a portable height-adjustable basketball system for $100. A basic in-ground basketball system will range in price from $250 to as high as $1700. Again, this price varies according to the size and material of the backboard as well as the range of height-adjustment, the rim capabilities, and the stability. Lifetime has an in-ground system for $290 while Goalrilla sells its best system for $1700. For example, the Lifetime 51550 Courtside Portable Basketball System retails for $210 to $300. Keep in mind that these are costs for those who just want the basketball court. If you were to want a half court system with everything installed, including the basketball hoop, the costs could be around $8,000 to $12,000 with full-color customizations. Full courts will cost close to double this amount. 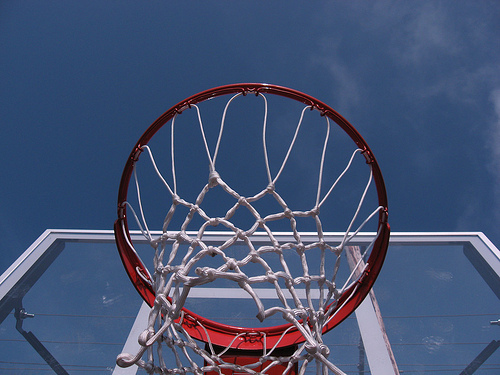 The two most common types of basketball hoops will either be portable or installed directly into the ground. A permanent hoop will be more stable and feel like you’re playing on a professional system, while a portable system will be easier to install and be moved around. Instructions on how to install (if it is an in-ground system) will be included with the system as well as any assembly instructions. The initial basketball system will come with a rim and a net; however, these may need to be replaced in the future. Some basketball systems come with a pad to cover the metal pole. This is for the protection of the players. Most hoops will come equipped with a warranty that can last up to a lifetime. If you’re building a brand new basketball court with concrete, plan on spending $4 to $7 per square foot to have concrete laid. If you are installing the system yourself, you will need certain materials. Sand is normally used to fill the base of a portable machine and concrete is used to install an in-ground system. Add-ons, such as a device, that brings the basketball back after you score can cost anywhere from $30 to $50. If you are purchasing an in-ground system and wish to hire someone to install it properly, this can cost around $100 to $400 depending on the model and complexity of your system. For example, produnkhoops.com charges about $450 to have an in-ground system installed. This fee would include two trips, materials and the labor. How much you spend on a basketball system will depend greatly on the use you will get out of it. If you are buying it for a child and are unsure if the child is going to be a basketball player, your best bet is to get a simple portable system that is fairly cheap. If the child gets a lot of use out of it (for more than just a few weeks when it is new), then you can consider upgrading to a more permanent basketball system. Another thing to consider is that portable systems are easier to re-sell in the future, but they are not as sturdy or reliable as in-ground systems. If hiring a professional to help install a permanent system, consider using HomeAdvisor.com to receive multiple quotes for free from local, licensed contractors. There are some people who have a very nice basketball system that does not get used and often put them up for sale on eBay and Craigslist.